How would a small, stumbling colt with the tough name Assault tell his own story of courage and victory? 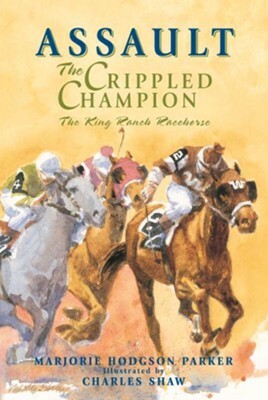 In this delightful true account of King Ranchs Triple Crown champion racehorse, Marjorie Parker involves her young readers in the life of the Texas Thoroughbred who ran on three hooves and a heart. Along with electrifying racing, this story gives an inside look at life on the historic King Ranch and recaptures life in another era through the eyes of a noble horse who never gave up. Marjorie Hodgson Parker is an award-winning author who has been widely published in newspapers, magazines, and books. I'm the author/artist and I want to review Assault: The Crippled Champion - eBook.